Merry Christmas to all of you! I will be gone until January 2nd. If you send me e-mails, be aware that I will only reply to issues that I deem important. There are a couple of new pictures and other changes in the Starship Database, most notably on the page about Earth Ship Classes. Thanks to Jörg! Here is a small article about the ships from the Star Fleet Technical Manual. The Alphabet Stories T-Z conclude the series by Katarzyna Marcinkowska. In the wake of the alarming demise of Trekpulse and other important sites I have taken the opportunity to weed out dead or dated links and rearrange the links page. I have replaced all photos in my little modeling section. Congratulations to the Trek Writer's Guild, winner of the EAE Award for December 2005! Added design notes by Allen Rolfes. Deck plans of 22 more Starfleet Museum ships by Allen Rolfes. Please follow the signs! Canon Fodder is a new site in the EAS family, a place for theories that fix continuity issues or to tie up loose ends in canon Star Trek. Have a look around! Nine new JoAT designs. See them at one glance. 25 more submissions had to be discarded, many of them because they were shameless plagiarism or didn't have any artwork. The musings about the Romulan make-up change have been updated. Poll: Which Trek movie is your favorite? Many minute amendments too countless to list. But most importantly here is a new page with Re-Used Weapons. More to follow. Redresses of the Akritirian Patrol Ship. 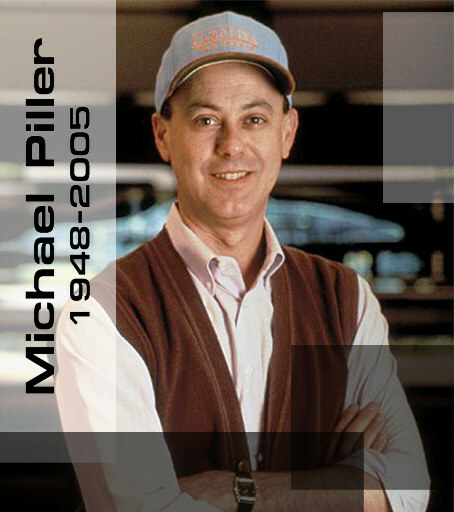 On a sad note, Michael Piller, the long-time executive producer and co-creator of Deep Space Nine and Voyager, died on November 1st at the age of 57. Ottens Archive wins this month's EAE Award. Congratulations! Several new thumbnails and pictures in the Starship Database. Please follow the signs. New in the Starfleet Museum: deck plans of several more ships by Allen Rolfes, especially of the Romulan classes. A Starship Database update is online, mostly new pics of Xindi ships from the Season 3 DVDs. Thanks to Jörg! Here is a story by Rony Tal, Star Trek Elita - The Discovery. GTJLCARS.de is the winner of this month's EAE Award. Congratulations! The winner of the Titan design contest is posted on the Pocket Books website. Please note this is a non-canon design which will not be added to my database! We attended the Galileo 7 Convention on Saturday, October 1st. Here is a Con report with some pictures. JoAT update. See all new designs at one glance. There are also a few new particles and substances. Amongst many almost unnoticeable updates and corrections there is a small write-up about Spot. Thanks to Bravo Simulations Group for their first site award! Important notice: I am on vacation until September 20. Upon my return I will only reply to the inquiries that I deem most important. Please refrain from sending me "Did you read my mail?" messages. Significant updates in the article on the Size of the Delta Flyer. Here are the Alphabet Stories M-S by Katarzyna Marcinkowska. Another part of the "Transition" series by Dominick Carlucci is entitled Crisis Point. On a related note, I am accepting no new fan fiction any longer because editing and reformatting long documents is very boring and disproportionate to the benefit. I will only post stories of the featured authors and from the backlog on my hard drive. Sorry, but with EAS I would like to focus on my own creative work. Please take part in the new Poll. The EAE Award for September 2005 goes to the probably most useful Trek site, Memory Alpha! I have reworked the previously crappy side views of the Nebula Farragut and Phoenix variants (saucer shape, windows, thrusters, pennants, nacelle placement). New: Bonchune variant. Enjoy several funny new Bloopers and Oddities. A couple of small updates: Boslics, new occurrences of Re-Used Make-ups, "Blue Squad" pin. See several Re-Used Emblems and a few more updates to the article series. Still more Re-Used Make-ups. Also, read about the changing faces of Andorians (updated entry) and Bajorans (new). New additions on the page about Re-Used Make-ups. Revised entries and much better pictures of some Klingon and Vulcan vessels, the ships of ENT: "Bounty" and several races with the initial letters S-Z. Today's batch of updates in the Starship Database includes an analysis of the vessels seen in ENT: "The Seventh". Besides a few rather cosmetic changes in the Starship Database, here is a side view of the old Klingon BoP. New pictures and findings about the Ktarian problem. We are going to point out many more make-up inconsistencies, beginning with new findings about the Norcadians. While I'm working on unnoticeable corrections all over the site, here are a few Non-Existent Ships. 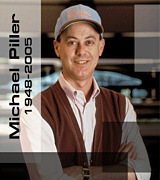 Congratulations to the winner of the EAE Award for August 2005, StarTrekArchiv. Planet Mutations: now including considerations about Qo'noS and Romulus. Read a new article: Planet Mutations - about planets whose appearance was subject to change, starting with Vulcan. 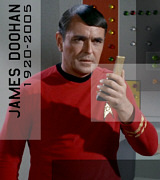 Sad news: Early this morning James Doohan died at the age of 85. "Aye." Besides small updates in the Starship Database there are several new items in Re-Used Props, Part 1 and Part 2. See funny mishaps, imperfections or in-jokes on screen in Bloopers and Oddities. After all my other efforts to fight spam have failed, the hopelessly spam-infested EAS Guestbook it is now password-protected. Please follow the directions. Note that I will not respond to inquiries, suggestions or complaints about that, I'm just sick of discussing it. On a more positive note, I have updated the article about the Size of the Oberth Class. See 16 new JoAT designs, all received through the submission form. While some accepted submissions are still in the queue, I'm sorry that almost 80% of all submissions had to be rejected because of missing or insufficient artwork. Congratulations to Tobias Weimann who wins the EAE Award July 2005 for his site, LCARS Interface. I conclude my TAS reviews with the marvelous "Yesteryear", "The Ambergris Element" and "The Counter-Clock Incident". The page about Federation Probes has been substantially upgraded with new information and pictures. Thanks to Jörg for collecting the facts! Furthermore I have added a couple of alien probes. We have compiled a quick article about the Redresses of the Reptohumanoid Ship with all-new drawings. Among many smaller updates there is a new side view of the Kazon carrier too. It has taken me five years, but here is an update to the Warp Propulsion article series, along with a more concise outline of the project. The chapters on Subspace and Warp Measurement are available as incomplete drafts. The entries about the Vulcan Surak class and Abaddon's Repository have been updated, among other changes in the Starship Database. Here is a write-up about the Redresses of the Wadi Ship by Jörg and me. The Guardian of Forever and Neutral Zone Starship Database receive this month's EAE Award. Congratulations! Better pictures of several Delta Quadrant vessels and a new Markonian ship. The sections about Ledosian, Malon vessels and Talaxian vessels in the Starship Database have been updated. Next round of the Starship Database update: all three Vogian and Wingari ships (spelling may be subject to change), a new Dralian beacon, updated side views of the green Klingon D7 and the "Latent Image" ship and some more pictures. More updates in the Starship Database and a new article about the Redresses of the Tarellian Vessel. Two dozen images in the Starship Database have been replaced with better ones. Thanks to Jörg and Alice! New: 22nd century hovercars, various Torothan vessels, Tholian cargo shuttle. This month's EAE Award goes to Star Trek New Voyages! Various small updates with facts from the final episodes. I conclude my Enterprise reviews with the anticipated rant about "These Are The Voyages". The review of "Terra Prime" is finished. On a different note, there is a massive backlog of items that I deem important and that I will work up with the highest priority: updates in the starship database, new race and planet inconsistencies, small corrections everywhere. All other updates and particularly user submissions will have to wait. Read the review of "Demons". Many updates are necessary in the Starship Database, starting with a new Hierarchy vessel and the pilot and series Constitution in our and the Mirror Universe. Here comes the review of "In a Mirror, Darkly". In the wake of "In a Mirror, Darkly" there are dozens of small updates all over the site, most notably of the Mirror Universe Ships. The review will follow shortly. I have updated and expanded the write-up about Creating a Successful Website. An article about the famous Vasquez Rocks, as seen on seven occasions in Star Trek. And an appeal not to bug me. I am waiting for the second part of "In a Mirror, Darkly" before updating anything. Here are the Alphabet Stories G-L by Katarzyna Marcinkowska. 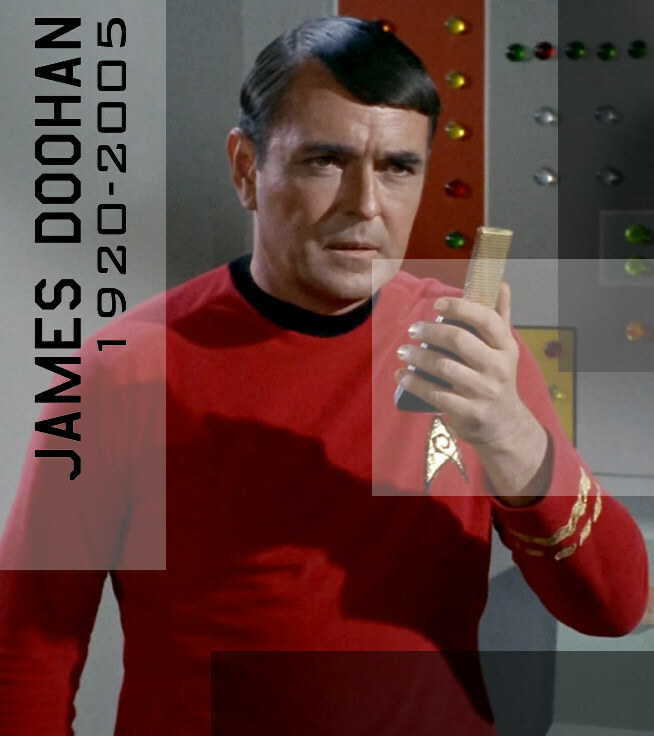 Thanks to Fleet Admiral JD for his award! Not much new today, but finally a small ASDB update (Andromeda & Apollo) and artwork of the Himalaya & Tanganyika. A few updates in the Starship Database. The review of "Bound" is available. Several new images in the Starfleet Museum, most notably the internal arrangements of Romulan War ships, created by Allen Rolfes. New Poll: What kind of Star Trek would you like to see in the near future? A fun analysis of the Re-Uses of the Angel One Matte Painting. The Evolution of Klingon Foreheads, now with over 70 images. TrekUnited receives the EAE Award for April 2005. Congratulations! As a supplement to the article about The Klingon Forehead Problem, see The Evolution of Klingon Foreheads in over 50 pictures with commentary. A couple of designs have been added to the JoAT. Reminder: Use the new submission form! Thanks to LCARS Main Databank for their award! There is also a new chapter of Star Trek Deneva by John Berkeley: Episode VII - Trial by Fire. Facts from "Divergence" and "Affliction" have been supplemented, most notably the update to The Klingon Forehead Problem. The reviews of "Affliction" and "Divergence" are available. Message to those who keep bugging me for weeks: Yes, I will update the Klingon Forehead Dilemma write-up. A few features are still missing, but the new submission form for the JoAT is functional. From now only submissions using this form will be accepted. The starships and other facts from the recent episodes have been added. On a different note, the hotlinking policy of EAS has been revised. Hotlinking (or image leeching) is now disabled, as I am no longer willing to pay for gigabytes of mindless image posts in blogs or bulletin boards that are mostly not even recognizable as the work of EAS. Prior to complaining, please read the complete blurb if this concerns you in any fashion. And here come "Babel One" and "United". Ships and facts from the latest episodes will be added later. The review of "Observer Effect"
A small Starfleet Museum update with new renders of the Krechet and Amarillo by Roberto Lima and a model of the Minotaur by Daniel Duna. TrekWeb is the winner of the EAE Award for March 2005. Here is the first of the missing reviews: "Daedalus". The write-up on the Klingon Bird-of-Prey size has been updated and extended with new pictures likewise. I have revamped the already classic article on the Defiant, adding new arguments and numerous screen caps by Jörg. Beta test phase of the new submission form for the JoAT. It is possible to upload images directly and get a preview of how it will look on the (still static) JoAT site. Please help me find bugs and try it out (but not too often for now!). A brand new article discusses the Size of the Excelsior Class and particularly the question if the ship might be much bigger than we thought. Star Trek Enterprise - Mistaken Identity is a new novel by Dominick Carlucci. Save Enterprise wins the EAE Award for February 2005. Congratulations! See a whole bunch of new alien emblems. Thanks to Jörg and Reverend for their help! What do you think of the cancellation of Enterprise? New poll. Clean-up of the Links page, some new links added. A couple of smaller updates can be found in the Starship Database, among them a "new" vessel, the Jefferies, better known as Raven. Thanks to Alice and to Jörg! Read Alphabet Stories A-F, six imaginative short stories by Katarzyna Marcinkowska. The Personnel and Vessel Profiles for the SID series by Travis Anderson. As a supplement, here are some examples of False Canon. Here is a write-up about Star Trek's Canon, defining the term, citing reasons and outlining a canon policy for EAS. Redresses of the Merchantman, incorporating new revelations. The series will be continued! Surprise in the Starship Database: a new Caatati vessel! Happy New Year and congratulations to The STArchive! The classic among the Star Trek reference sites wins this month's EAE Award.